Premiere episodes of Anything But Plain air on EVA from Mondays to Fridays at 15h00. Primetime episodes air at 21h00. Augusto involves Roberto in his money laundering scheme. 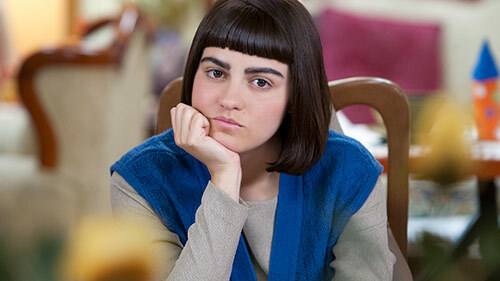 Lichita convinces Magos to move Ximena to a better school. Alex's mother refuses to attend his wedding ceremony. Luciana assures Nestor and Chuchette she'll recover her place in the agency. Augusto tells Roberto he wants him to work in his "other business". Beatriz welcomes Kenny to the family. Elsa and Nacho return. Roberto assures his son he'll take him away without his mother knowing. Augusto reminds Roberto to end his relationship with Carmona. Sheila is amazed when she is arrested instead of Roberta. Alicia proves that Sandra stole the campaign and gets a new account. Nacho and Elsa reach an agreement about paying the credit card debt. Magos has problems with her professor. Augusto makes Roberto sign documents which make him look like an accomplice in the laundering business. Sandra cannot get a job in advertising. Lichita becomes a tyrant. Alicia finds out Luciana is cheating on Roberto. Gerrys and Pau convince Magos to make a cheat sheet for her exam. Licha suggests it would be good for Dafne and Augusto to get closer. Gumaro admits he is Luciana's lover. Luciana receives shocking news. Elsa is angry when Nacho doesn't pay his credit card debt. Luciana tells Roberto she's pregnant. Augusto tells Lichita he is in love with her. Elsa finds out Nacho didn't make a mortgage payment. The Gutierrez's house is seized by the bank. Luciana tells Gumaro she doesn't want to see him again. Elsa and Nacho ask each other for forgiveness. Nestor is glad when Roberto visits him at the hospital. Roberto advises Gumaro to get Luciana's forgiveness and leave. Augusto assures Lichita that he'd never do anything that she doesn't want. Roberto finds out there's going to be an audit in the "LPA". Gumaro tells Alicia the truth about Roberto's problems. Brisa and Braulio are left homeles. Lichita finds out Luciana is expecting Roberto's baby. Magos assures her mother she'll pay all her debts. Luciana explains why she believes Augusto killed Rafael. Alicia informs Carmona that she will try to get proof against Augusto. Lichita finds Mateo. Luciana is in the hospital. Augusto orders Draco to fire Miranda. Lichita's family finds out Roberto is in jail. There is a heated debate when Augusto discovers documents which compromise him tucked away in Alicia's bag. Augusto must feign madness so he's not taken to jail. Valeria and Luciana organize an exhibition with Rafael's paintings. Mateo is taken away.